Rasor Zero702 is a new battery powered hand held round knife cloth cutting machine fitted with a larger 70mm (2.75") blade and carbide counter blade for scissor like precision cutting. 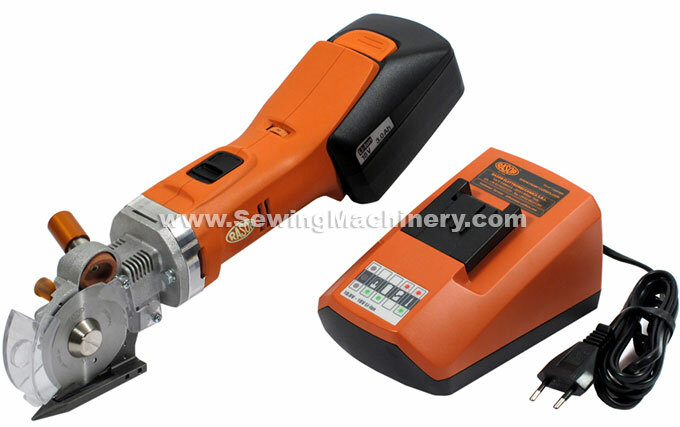 Currently the most powerful hand held battery operated cloth cutter machine on the market. This versatile hand held cordless industrial cutting machine can be used to cut many different materials including hard materials. The Rasor Zero 702 features a 400w equivalent high torque motor which is combined with a bronze/steel coupling gear to develop impressive cutting power. The motor speed is dial adjustable between 600 to 1000 RPM to suit different materials and cutting applications. The latest generation lithium ion (Li-Ion) technology is utilized to develop a 18V rechargeable battery pack rated at 3 Ah.